TSPSC AEE /Assistant Executive Engineers Results, Interview dates 2018 / TSPSC AEE /Assistant Executive Engineers Recruitment Results, Certificates Verification dates 2018: TSPSC AEE/Assistant Executive Engineers Recruitment 2017, Answer key, Results/ TSPSC AEE/Assistant Executive Engineers Recruitment 2017 Hall tickets, Online application form/ TSPSC AEE/Assistant Executive Engineers Recruitment 2017 Notification:TSPSC Assistant Executive Engineer Posts 2017, TSPSC AEE Posts, How to apply, Hall Tickets, Results: TSPSC has given the Assistant Executive Engineers Posts 2017 recruitment notification and Applications are invited Online from qualified candidates through the proforma Application to be made available on Commission’s WEBSITE (www.tspsc.gov.in) to the post of Assistant Executive Engineers in Various Engineering Services in the State of Telangana. On the basis of the results of the written examination held on 27-08-2017 and 28-08-2017 and Oral test (Interview) held from Dt: 13-03-2018 to19-03-2018, and Dt: 09-4-18 at TSPSC Office, Hyderabad to the post of ASSISTANT EXECUITIVE ENGINEER IN I& CAD and R&B Departments, the following Hall ticket numbers have been provisionally selected for appointment to the post of ASSISTANT EXECUITIVE ENGINEER IN VARIOUS ENGINEERING SERVICES vide Commission’s Notification No.31/2017, Dt: 02-06-2017. The selections are published here with subject to the following conditions. any action as it deems fit in the circumstances of the case, in terms of the provisions as notified in TSPSC Rules of Procedure published in Telangana State Gazette No. 60., Dt: 28/12/2015. The selections are subject to the final outcome of W.P.s and other cases pending if any, before the Hon’ble Courts of Law. TELANGANA STATE PUBLIC SERVICE COMMISSION. ASSISTANT EXECUTIVE ENGINEERS IN VARIOUS ENGINEERING SERVICES (GENERAL RECRUITMENT) NOTIFICATION NO: 31/2017 RESULT NOTIFICATION FOR ORAL TEST (Interviews). On the basis of the written examination held on 27-08-2017 & 28-08-2017 and Verification Certificates held from 17-01-2018 to 19-01-2018 to the post of Assistant Executive Engineering in Various Engineering Services, the candidates with the following Register Numbers (1st Spell) have been Provisionally admitted for the Oral test (interview), subject to court orders if any. The candidates who have qualified for Oral Test (Interview) are required to attend at TSPSC Office along with hall ticket, Original Certificates and two (2) Passport size photos on the relevant date and time as mentioned in the following schedule. If, on further Verification, it is found that any candidate is not eligible with reference to the particulars furnished by him/her in the Application Form / Checklist / Certificates, the results of such candidates shall be cancelled at any stage of selection process. TSPSC has conducted Written Examination for the above notifications from 27/08/2017 to 28/08/2017 FN & AN. The Final Keys of these exams will be available on TSPSC website from 16/11/2017. No, Further objections will be entertained. 1 Assistant Executive Engineers (Civil) in I & CAD Department Must possess a Bachelor’s Degree in Civil Engineering of a University in India established or incorporated by or under a Central Act, Provincial Act or a State Act or an Institution recognized by the University Grants Commission / AlI India Council for Technical Education or an Equivalent qualification. 2 Assistant Executive Engineers (Electrical) in I & CAD Department Must possess a Bachelor’s Degree in Electrical Engineering or Electrical and Electronics Engineering of a University in India established or incorporated by or under a Central Act, Provincial Act or a State Act or an Institution recognized by the University Grants Commission / AlI India Council for Technical Education or an Equivalent qualification. 3 Assistant Executive Engineers (Mechanical) in Ground Water Department Must possess the B.E. Degree (Mechanical) or B.Tech (Agricultural Engineering) of a University or an Institution recognized by the University Grants Commission or an Equivalent qualification. 4 Assistant Executive Engineers (Electrical) in R & B Department Must possess a Bachelor’s Degree in Electrical Engineering of a University in India established or incorporated by or under a Central Act, Provincial Act or a State Act or an Institution recognized by the University Grants Commission or an equivalent qualification or a pass in sections (A) & (B) of the Institution of Engineers in Electrical Engineering. 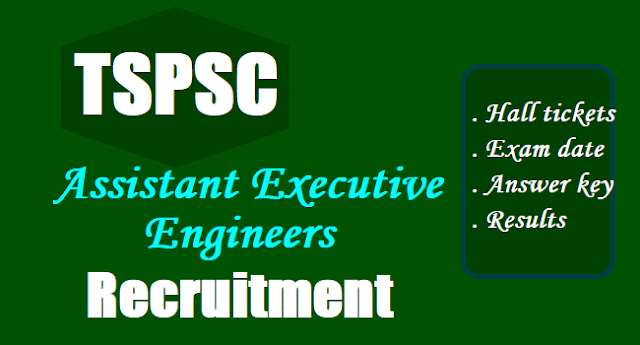 5 Assistant Executive Engineers (Civil) in R&B Department Must possess a Bachelor’s Degree in Civil Engineering of a University in India established or incorporated by or under a Central Act, Provincial Act or a State Act or an Institution recognized by the University Grants Commission or an equivalent qualification. 6 Assistant Executive Engineers (Civil/Mechanical) in Tribal Welfare Engineering Department Must be a Graduate in Engineering (Civil/Mechanical) from any University in India established or incorporated by or under a Central Act, Provincial Act or a State Act or an Institution recognized by the University Grants Commission or an Equivalent qualification. iii. Hall Tickets:Hall Tickets can be downloaded 07 days before commencement of Examination. The Examination (Objective Type) is likely to be held on Dt.27/08/2017 F.N & A.N 28/08/2017 F.N. The Commission reserves the right to conduct the Examination either COMPUTER BASED RECRUITMENT TEST (CBRT) or OFFLINE OMR based Examination of objective type.